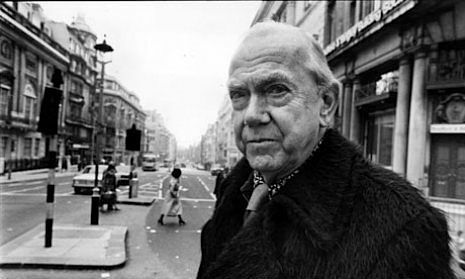 If the first volume of his autobiography A Sort of LIfe is to be believed, then the novelist Graham Greene did not have a very auspicious childhood. His earliest memory was of sitting in his pram atop a hill, with a dead dog at his feet. When he was five, Greene walked with his nurse close to an alms-house, outside of which a crowd had gathered. Suddenly a man rushed forward and into the building. It was said he was about to cut his throat. Greene and his nurse waited among the wide-eyed spectators, until the man appeared at an upper window and cut his throat. Greene did not recall the latter part, but his brother Raymond confirmed what happened. ...I was terrified by a witch who would lurk at night on the nursery landing by the linen-cupboard. After a long series of nightmares when the witch would leap on my back and dig long mandarin finger-nails into my shoulders, I dreamt I turned on her and fought back and after that she never again appeared in sleep. Dreams, we are told, were important to Greene: “the finest entertainment known and given rag cheap,” and he claimed two of his novels and several short stories “emerged” from his dreams. He also suffered what he described as “terrors”: a dread of birds, and bats, and a “recurring terror of the house catching fire at night”. In his teens, Greene had a breakdown, caused by “the interminable repetitions” of school life, “its monotony, humiliation and mental pain.” It led him to seek “forms of escape”: he cut his leg in a misguided attempt at suicide; “drank a quantity of hypo under the false impression it was poisonous”; downed a bottle of hay-fever drops, which contained a miniscule amount of cocaine; picked and ate some deadly nightshade, which had a slightly narcotic effect; and swallowed twenty aspirins before swimming in the empty school baths. Greene was sent for psychoanalysis, where he “nearly” fell in love with his analyst’s wife, and soon after with another patient (a ballet student). He then began to invent answers in response to his analyst’s probing questions, but fails to reveal if his analyst was fooled by his dissembling. In 1923, at the age of sixteen, Greene found a pistol in a corner cupboard in the bedroom he shared with his brother. One man would slip a charge into a revolver and turn the chambers at random, and his companion would put the revolver to his head and pull the trigger. The chance, of course, was five to one in favour of life. ...I might feel it necessary for verisimilitude to make him hesitate, put the revolver back into the cupboard, return to it again after an interval, reluctantly and fearfully, when the burden of boredom and despair became too great. Unhappy love, I suppose, has sometimes driven boys to suicide, but this was not suicide, whatever a coroner’s jury might have said: it was a gamble with five chances to one against an inquest. The discovery that it was possible to enjoy again the visual world by risking its total loss was one I was bound to make sooner or later. This experience I repeated a number of times. At fairly long intervals I found myself craving for the adrenalin drug, and I took the revolver with me when I returned to Oxford…. Then it was a sodden unfrequented lane. The revolver would be whipped behind my back, the chamber twisted, the muzzle quickly and surreptitiously inserted in my ear beneath the black winter trees, the trigger pulled. Slowly the effect of the drug wore off—I lost the sense of jubilation, I began to receive from the experience only the crude kick of excitement. It was the difference between love and lust. Though he suffered from bouts of “boredom” or rather depression in later life, Greene never repeated his gamble with death again. His brother Hugh, however, was skeptical of Graham’s story, and it has been suggested Greene would have known exactly where the single bullet lay in the chamber by the weight of the gun. Why Graham Greene indulged in this game of Russian roulette is perhaps explained by the particulars of his childhood. His father was headmaster at Berkhamsted School. The family were domiciled in one part of the house, the other part doubled as the school rooms. The symbolic point of entry from one world to the other was through “a green baize door,” just beyond his father’s study. At home, his mother was distant, and the young Greene could have no close affiliation with his father, as he was his headmaster. While at school, Greene was viewed as a “Quisling,” a collaborator with the classroom enemy, someone not to be trusted by the other pupils. It left Greene isolated and desperately alone. The thirteen weeks of a term might just as well be thirteen years. The unexpected never happens. Unhappiness is a daily routine. I imagine that a man condemned to a long prison sentence feels much the same. I cannot remember what particular item in the routine of a boarding-school roused this first act of rebellion—loneliness, the struggle of conflicting loyalties, the sense of continuous grime, of unlocked lavatory doors, the odour of farts (it was sexually a very pure house, there was no hint of homosexuality, but scatology was another matter, and I have disliked the lavatory joke from that age on). Or was it just then that I suffered from what seemed to me a great betrayal? This sense of betrayal was to influence all of Greene’s life and fiction—it is the theme in the majority of his writing, and a factor in his relationships with others. It was also the subconscious influence on his near fatal actions in 1923—for Greene there could be no better self-vindication than the attempted betrayal of his own life.